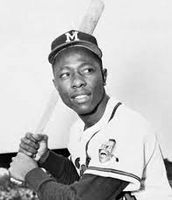 Hank Aaron a fairly new baseball star has just broken Ruth's record. He is a new African American Atlanta Braves recruit. Hank went to Central Highschool during his freshman and sophomore years, later he transferred to Josephine Allen Institute during his Junior year. He thought win-win by playing both, football and baseball at both schools. Each team had one more player. 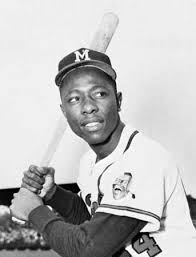 Henry Louis Aaron was born into a humble family on February 5th 1934, in Mobile, Atlanta. 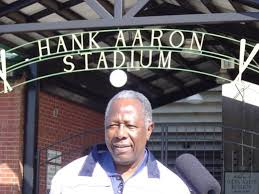 As of today Hank Aaron is 81years old. His nickname is Hank Aaron while his full name is Henry Louis Aaron. To get to the MLB he had to be proactive and focus on sports as much as he could. If I could meet Hank Aaron I would ask him if he ever wanted to quit playing baseball. I would ask him this because I think it would be very hard to get all the way to the MLB without wanting to quit. I think I could learn to never stop working toward your goal from his leadership abilities.